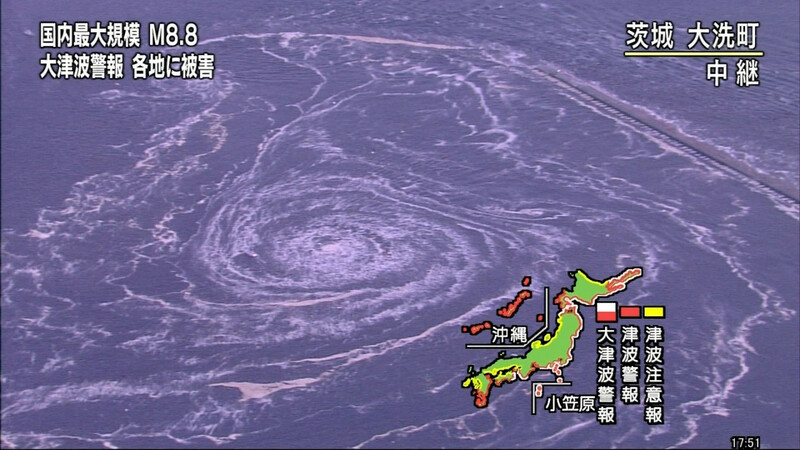 Following the country's largest earthquake in recorded history , Japan is being hit by it's most ferocious tsunami. People across the country are glued to their TV screens as scenes of a tsunami measuring more than 7 meters in height sweeping away cars and buildings flashes across the news. Meanwhile, other parts of the world are bracing for the worst, with Hawaii ordering an evacuation of coastal areas  and warnings issued in at least other 20 countries . The Guardian is posting live updates  on the disaster. Just a sampling of messages on Twitter. Please don't think of tsunamis as “waves”, but as “concrete walls which plunge at extremely high-speed”. Humans are no match for them. Please do not go to have a look out of curiosity. Pacifico Yokohama [convention center] facing tsunami threat, so they stopped accepting people! Victim of tsunami here. Am at residence 2F with my mother, brother, and a neighbor waiting for rescue. No injuries. 1F is flooded and we can’t get out by ourselves. Also phone is not connected. For up-to-the-minute coverage of the earthquake aftermath, follow NHK's official ustream .